Göteborg (Agfa Creative Alliance, 1998). Part of the Swedish Set with Stockholm and Uppsala. 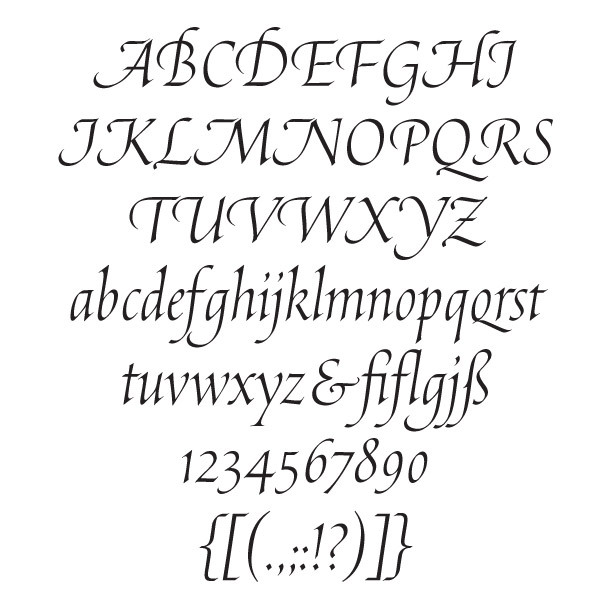 Based on the italic calligraphy of Erik Lindegren (1918–1996). Lindegren was a Swedish printer, designer and calligrapher who was most famous as the author and designer of Våra bokstäver. A. Skrift, B. Trycktyper, C. En historisk översikt [An ABC Book of Lettering and Printing Types] (Askim, Sweden: Graﬁsk Studio, 1964–1965). He lived in Göteborg (Gothenburg). Göteborg was designed with the permission of Lindegren’s family.